Periodically I create a write-up on a fantasy creature that is featured in some of my short stories. This posts Featured Fantasy Creature: the Drog. 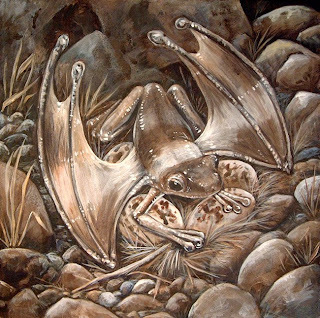 The name is derived from "frog" and "dragon" because of the wings amazing similiarity to that of a dragons. These awkward creatures are fun to watch fly through the forest and over grass fields. 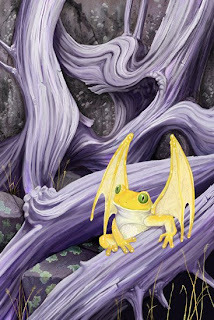 With their plump frog-like bodies and dragon-like wings, they soar through the air one short flight at a time. Their leathery membrane wings can support them for only short distances, approximately three yards, and then they plummit to the ground, landing on all four legs with a thud. Their eyes protrude from the head slightly and are normally a shade of amber. There are two sets of eyelids that flicker open and shut every few seconds. With four sets of legs, the hind legs are approximately twice the size as the front legs to propel them off of the object they sit and into the air. The back two webbed extremities include five digits; the front two consist of four digits. Their skin is sleak, smooth, and cool to the touch. The body and wings are of very similiar color with the wings being a slighly lighter shade of the body color. Common types include emeralds (green) and browns (brown). Uncommon types include silver (gray). Rare types include goldens (yellow). There may be undiscovered color variations at this time. Some Drogs have splotches or patches of varying colors upon their skin but are not a prominent feature. Few scholars believe this is a sort of camoflouge some are developing, while others believe these Drogs are impure and abominations of nature. Upon sensing danger these creatures will merely stop moving all together in hopes that their perceived predator glances past them and moves on. Effective, at times, but this could be the very reason they are quite rare to come across in the wild since most of the time their predators win the encounter. I never claimed they were very smart. Many have tried capturing these creatures with little success. Thus far those that have managed to do so end up no better in the end. Each captive Drog seems to rather die then move to eat, drink, or even procreate. Most of the species are believed to be males; with a belief that the golden Drogs are the females. Mating has never been witnessed, but most likely it takes place in the privacy of thick forests and other areas with dense vegitation and coverage. All artwork in this post copyright Ursula Vernon. I love this kind of free form creativity in my own writing. It's perhaps the single most enjoyable activity in writing, especially fantasy. I don't know if you saw my "heen" post about creating a new fantasy creature.